The article appeared first in Steven's Window column in The National newspaper. Friday 20th November 2009. The inspiration could have been my stories about the prison writings of PNG’s John Kasaipwalova, Kenya’s Ngugi wa Thiongo, or the Italian Marxist Antonio Gramsci’s Prison Notebooks that got the Buimo prisoners and warders to write their stories during a writers’ workshop between October 26th and November 6th, 2009. Doris Omaken and Jill Pijui of the PNG Bible Society coordinated the writers’ workshop. UPNG colleague Sakarepe Kamene and I facilitated the workshop as part of our community outreach obligation. 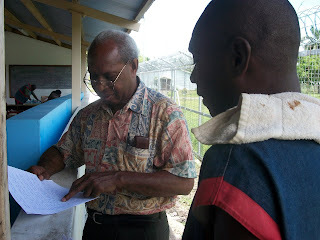 From the experiences gained in working with village people to get them to write their stories down on paper that was published as the Zia Writers of Waria we agreed to work with the PNG Bible Society in running a writers’ workshop at the Buimo Prison in Lae, Morobe Province. The writers’ workshop in Waria was three days long, but very successful and empowering to the village people used to gardening, fishing, hunting, and feasting. The Buimo Prison writers’ workshop took ten days. With more time at our hand we introduced other aspects of a writers’ workshop. Enough time meant more time for writing, more flexibility, and space for quality interactions with participants. In the end we developed new friendships through the writers’ workshop. We approached the workshop with two considerations: First, we believed, that everyone had the skills and interesting experiences to tell stories. The Buimo Prison writers’ workshop began with storytelling. We guided the participants to write these stories down on paper. Second, we decided against using papers, fixed structures, and programs. Our view was that using the techniques used in formal university classrooms was intimidating to learners at the village level or in prisons. Our approach was simple, flexible, and allowed a lot of verbal interactions. Participants grasped what we wanted them to know without developing learning anxieties. As much as possible we insisted on the writing process to begin and develop without any form of barriers, be they psychological, linguistic, physical or mechanical. Participants were encouraged to express themselves in a free and open spirit. The approach worked for every participant, including prisoners, CIS officers, and prison ministers. Two CIS officers from Beon Prison in Madang attended the workshop as well. The Buimo prison writers’ workshop is the first we conducted within the prison walls in Papua New Guinea. Buimo prison has the only classroom set up by the School of Hope, a church run facility in Lae. We introduced the fundamentals of writing and different techniques of writing short stories and essays in the first week of the workshop. We also introduced elements of style and different writing problems. We guided the participants, in the second week, to write their life narratives, imaginative stories, and collective reactions to common issues using a non-fiction genre. The participants impressed us with their understanding of the writing process with group presentations of short stories, essays, and personal stories in the second week. The stories had us laughing and near tears hearing the personal side of the prisoners. What takes a semester of 14 weeks to teach at the University of Papua New Guinea was condensed to two weeks in the Buimo prison writers’ workshop. Anyone can write with the right kind of encouragement, approach, techniques, and tools of writing. Our approach worked in a village environment and now at a prison setting. The time it took to get someone who has never written a short story or essay before to write again is the best experience to witness. The prisoners have a lot of time for devotion and reflection on life. Introducing them to writing techniques and having them write down their experiences can serve as a therapeutic exercise and as process of self-expression. The writings produced in the workshop had one strong impression. The prisoners are now equipped with the knowledge and techniques of writing their life stories in short prose or if need be, as a book. Some of the participants indicated that the workshop has given them a new ray of hope in life’s difficult journeys. Sharing their personal experiences with us through writing gave us a glimpse into their lives outside and inside of the prison walls. As it turned out three inmates were friends I have known before, but had no idea they were in prison for being on the wrong side of law. Nonetheless, I was happy to share the moments with them as a friend visiting them in prison. The writers’ workshop gave us also the opportunity to learn, develop, and sharpen our methodologies in conducting such workshops. We learnt that using papers and adhering to traditional rules and structures of writing is less helpful to participants. Conducting workshop in Tokpisn and code-switching to English and back to Tokpisin helped a lot in making sense of what we wanted the participants to know. Working with prisoners we maintained a none-judgmental, none-emotive, and bias free discourse. Keeping the eye on the ball, we dribbled through the many challenges out there in working in such a situation with such a special group of learners. Our goal to get completed short stories and essays written during the workshop was accomplished. An anthology of writings from Buimo Prison is expected to be published in the coming year. The prison writers have given us something to think about for a long time to come. The experience also gave us the opportunity to interact with correction officers. Those who participated in the workshop expressed gratitude and appreciation to us for giving an opportunity for them to up-skill themselves to deal with the complex challenges of rehabilitation, especially where additional knowledge is needed. The success of the Buimo writers’ workshop remains a benchmark in literacy work for the PNG Bible Society and the Correction Services in the country. I hope similar writers’ workshops are possible throughout the country. The PNG Bible Society can now call itself as the leader of prison literacy and writing projects. The experience gained in the Buimo writers’ workshop can now guide future prison writers’ workshop.